George Copeland Ault was born into a prosperous Cleveland family, and spent his formative years in London. Ault’s father was a wealthy businessman whose family owned a printing ink manufactory. His father was also an amateur artist and a devoted patron of the arts in New York and the Midwest, helping to found the Saint Louis Art Museum and the Cleveland Museum of Art. In 1899, the father’s business brought the family to London where they lived for the next twelve years. Ault received his formal and artistic education abroad at the University College, the Slade, and St. John’s Wood School. He supplemented his academic studies with regular trips to Paris and the French countryside. Although Ault was in Europe during a burgeoning period in modern art, his conservative education led him to prefer academic painting styles. His early paintings were impressionist in style, and he did not discover and experiment with modernism until he returned to the United States in 1911 at the age of twenty. Ault married and settled into a new life in Hillside, New Jersey, a suburb of New York. He was restless with this slower pace of life and chose to spend most of his time wandering Greenwich Village and studying art. In 1920, Ault participated in his first exhibition in New York at the 4th Annual Exhibition of the Society of Independent Artists. Following this exposure, he began to more freely experiment with modernism by the early 1920s. In 1922, Ault abandoned his wife to live permanently in New York and devote his career to painting. Ault quickly embraced the Precisionist style that he learned of through the works of Charles Sheeler and Ralston Crawford. The subjects of his works from this period were geometric cityscapes observed from his studio window and the rumbling factory buildings that increasingly populated the congested city. 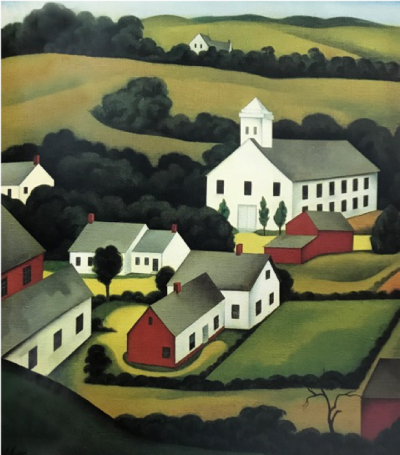 He reduced the buildings and skyline of the city into basic shapes with flat areas of color, hallmark characteristics of the Precisionist style. However, he developed his own unique style by also combining elements of surrealism into his paintings; Ault admired the surrealist works of Italian artist Giorgio de Chirico. By 1923, Ault was a regular exhibitor at the Whitney Studio Club, and later would show his work at major progressive New York galleries like Stephan Bourgeois and F. Valentine Dudensing, JB Neumann’s New Art Circle, and Edith Halpert’s Downtown Gallery. 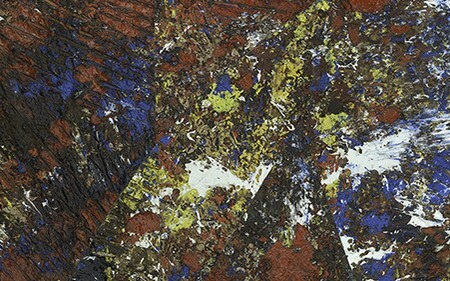 In 1932 and 1934, he exhibited at the first two biennials at the Whitney Museum of American Art. 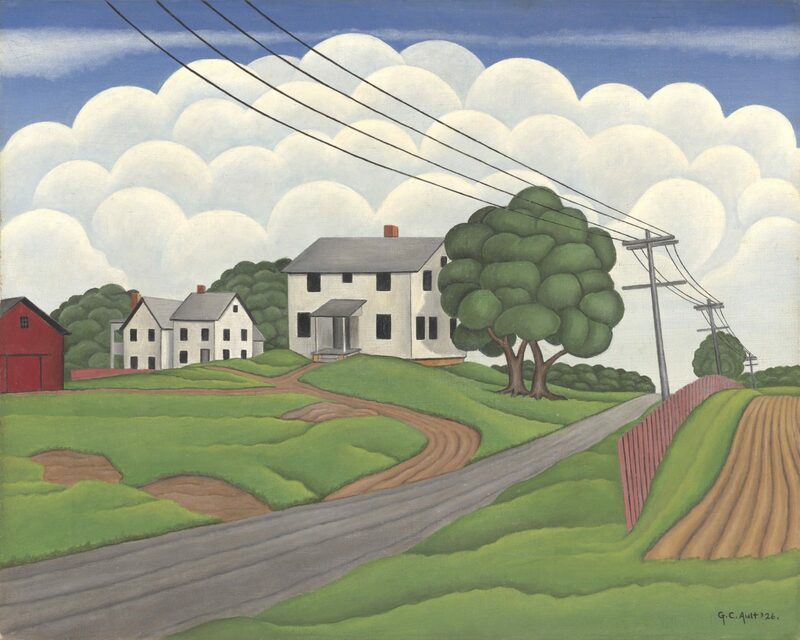 The present work, Country Lane, was among Ault’s earliest expressions of American primitivism. Simple, white farmhouses and large trees stand at the center of the composition, with a winding road intersecting the scene. The other elements in the composition—a red barn, rolling green pastures, a picket fence, and an endless power line complete the idyllic country setting. 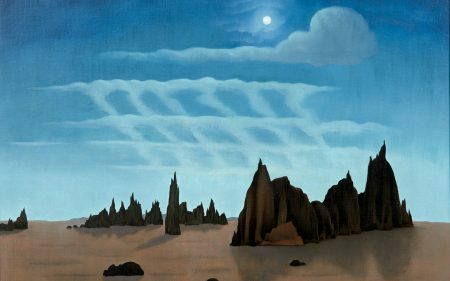 However, the flat and saturated paint application and the repetition of geometric forms, seen in the tiny windows and the bulbous clouds and tree shapes, firmly situate this work among Ault’s best Precisionist paintings. Ault’s artistic career was crippled by several family tragedies and personal struggles. Over the course of his career, he suffered the loss of all but one sibling from his immediate family. 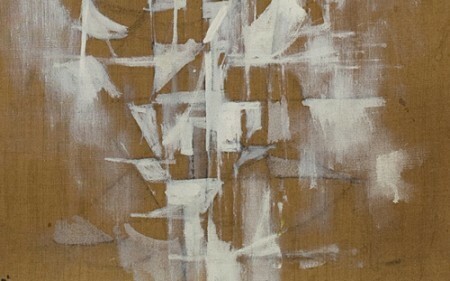 Ault also struggled to maintain gallery connections as he was disillusioned by the changing art market and severed ties with many of his peers and supporters. He preferred to work independently, and in 1937 he left New York to live in the Catskills with his wife, Louise. In the final years of his career, Ault focused on rural nocturnal scenes combined with elements of surrealism.